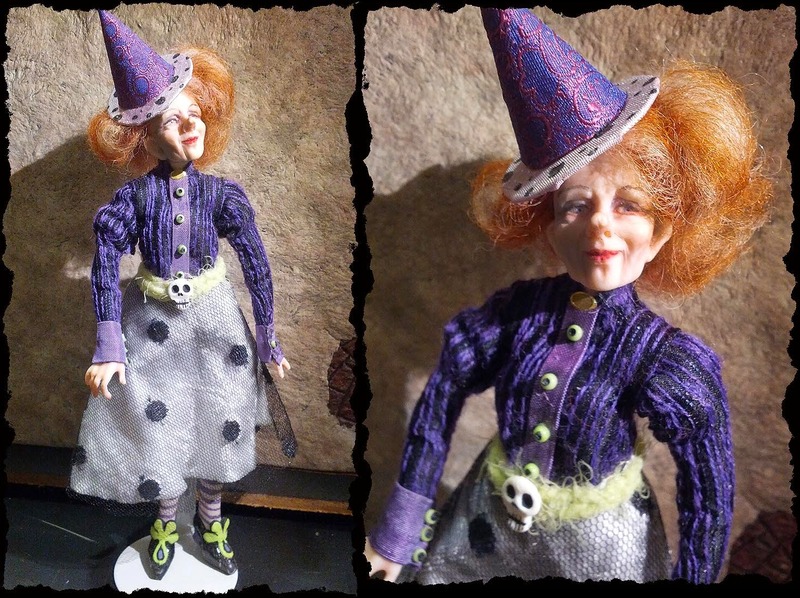 I wanted to show you a new witchie addition to my minis... Isn't she wonderful? I love her face who ever created her did a wonderful job. I have no clue who made her and she is not signed. Currently she is hanging out on my craft table. Because of her size I will need to create her own scene as she is 7inches tall from the top of her head to the bottom of her boots. Although her lower half is wire to her knees, maybe I can put her in a high back chair and she will not look too out of place. Ohh then she could be at a table mixing potions or reading a book. I can see it now she could be reading in her favorite chair with piles of books, drippy candles and all. Maybe in one of those glass domes... Ok yet another project to add to my "To do list". Have a great week everyone and thanks for looking.